As the plague races across the English countryside during the summer of 1348, a company of nine unlikely travelers come together in a desperate hope to outrun it. Each carries a devastating secret that they are hiding from the others and one will bring about a swift and terrible retribution upon those who are keeping things hidden. The group includes Camelot, an itinerant peddler of holy relics who quickly becomes the leader of the company; a minstrel and his young, hot-headed apprentice; and a strange disfigured man on the run from the law. As they journey from one devastated village to the next looking for refuge, they each discover that their companions are not what they seem and they must band together, despite their reluctance, to escape the strange predator that is shadowing them and slowly decimating their group. Filled with haunting drama and unforgettable characters, Company of Liars is a dark work of fear, retribution and secrecy. I just don't know what it is about the past few months. It seems I just can't pick a really good read for myself and it's been quite frustrating. I am doubly aggrieved that this book was so disappointing because I had been so excited to read it and had saved it for myself to savor during a reading slump. Needless to say, it didn't pull me out of my slump at all. This book had great potential and a truly terrific sounding plot, but somehow things really fell short for me. I don't know whether this is because I had some unrealistic expectations for it or because it was just such a messy book. First of all, I felt that the pacing of the book was just glacial. There was too much space between action scenes and that space was not utilized in a creative way at all. There was a lot of useless meandering of the plot and character descriptions and it gave the book a very unwieldy quality that I found intensely boring. In fact, it took me forever to get through the book because my attention wandered so much, and once I put it down, I was hard pressed to find a reason to pick it up again. As I have said in other reviews, books that deal with the plague have instant appeal to me. I guess you could say that the plague is one of my specialties. I was very disappointed that this book was ostensibly about the plague but failed to deliver what I had hoped for. It seemed that the plague was only included in the story as a plot device. It was the impetus for the story, but not the story itself, which I only discovered about halfway through the book. Normally this wouldn't bother me so much, but I felt like I had been a bit snowed into expecting something that was not fully delivered to me. In fact, the plague took up such little page space that it was easy to forget it was there at all. It felt like the author pulled the plague card out of her pocket whenever the story became too heavy handed, as a way of reminding the reader just what the purpose of the travelers' journey was. I think that if the author had focused a bit more on this element of the story the book would have been more appealing to me. On the other hand, I did feel like the book had some great character portrayals and that each character was fully realized and three dimensional. The problem that I had was that despite this, I didn't really feel like I could connect with any of them, and that made it harder for me to get invested in their plights. Don't get me wrong, I did like some of them, but there was just such a strangeness to them and they were just too secretive to get a real handle on. I think that might have been an intentional construct by the author, but whatever the reason, it left a bad taste in my mouth and frustrated me. The characters were creatively crafted and were very unique, but the author didn't use that to her advantage. Instead she dulled them and softened their impact by making them so hard to connect with. Another problem that I had with the book was that the writing felt very raw. There were points where there was just too much exposition and the back story was introduced in a very clunky andunsmooth way. I am aware that this is the author's first book, but there is a reason that editors exist, and in my opinion, the editing was lax. I didn't like the wandering and unfocused quality of the writing and I felt that much of the book lacked direction. The writing felt labored and slow and it gave the appearance that the author was really struggling with her story. In all fairness, I don't think I can recommend this book to anyone. It was much too dark to fully enjoy and the myriad problems I had with it prevent me from giving it a thumbs up in any way. I am hoping that I can soon find a book that not only whets my appetite but fully delivers on its potential. In the meantime, if anyone knows of a book that surely won't disappoint, I am all ears! After a treacherous border crossing from Mexico with her younger siblings, Flora Enriquez starts a new life in Texas and slowly begins to realize the American dream. Soon Flora is living life as a mother, wife and teacher, but fate has other plans for her. These unexpected plans arrive in the form of Roy, Flora's violent, drug dealing brother-in-law, who comes to chase her down with a gun after she destroys a stash of drugs he has hidden in her home. After shooting her and leaving her for dead in the Texas desert, Flora is whisked away by a group of well meaning refugees to begin a grueling trek across the country that will test her in ways she never expected possible. This harrowing debut novel witnesses Flora's extreme struggle, first for her survival, then to rebuild her shattered life and family. Though the premise of this book really intrigued and excited me, I ultimately ended up feeling a little disappointed by it. At times I felt that the practicalities of the story were not very realistic or believable and I really had a hard time engaging with the characters. First off, I felt that the sections that took place after Flora's accident didn't seem at all plausible. After being shot at close range in the neck, I had a hard time believing that she was able to survive the incredible trek across country in the back of a rail car before receiving medical treatment. Even someone who is not well versed in medicine, like me, knows that the first few hours after a spinal injury are critical to a patient, and that I felt that the author, who is also a doctor, should have known this as well. I just didn't believe that Flora would have survived these events, much less eventually make a full recovery. Another thing that bothered me about this book was the fact that the characters' personalities were not finely delineated at all. I never felt that they were real people with distinct personalities. It felt too much like they were artificial constructs, characters made for the sole purpose of acting out the events in the story. They seemed very cardboard and stiff, and even in their dialogue they had no spark or life. As I was reading through the narrative, I kept wishing that the author would do something to make his characters more memorable and human but that never came to pass. There was a huge dearth of individuality in these people that made it really hard for me to care about them, which ultimately kept me from connecting with their story. The writing style was also something that I took exception to. The story felt very forced and rushed and there wasn't a natural cadence to the narrative. It was more like a set of events that kept relentlessly moving forward, one event after the next, with no pause for meaning or insight. Though I did find the nuts and bolts of the story to be very engaging and interesting, I felt that the intended impact of the story suffered a bit in the execution. There was a lot going on plot-wise and some of the plot elements were honed perfectly, but those points were not left to percolate or absorb gravity. Instead they were smashed between other high-impact plot points, which gave the book an overwhelming feel of haste. Though I had some problems with this book stylistically, I felt that there were some really exciting aspects of the story. One of the things I particularly liked was that it didn't rely too heavily on coincidence. Most of the plot felt very natural, and despite the reactions I had to the circumstances surrounding Flora's injury, I felt that her recovery and the emotions she had surrounding it were very genuine and heartfelt. I also thought that the book had a lot of suspenseful moments, which gave the story and writing a stirring quality that I had not been expecting. As a matter of fact, I think that this book would probably make a great read for those who enjoy the suspense genre and are looking for something a bit atypical. It was definitely a very thought-provoking read. Readers may want to visit the author's website. Towner Whitney has just journeyed home to Salem Massachusetts to recuperate from illness and deal with a strange tragedy that has befallen her aunt. Home is a place that Towner never thought she would be revisiting after the catastrophic traumas of her early life, and she is none too pleased to have to return to the place where so many horrible memories lay buried and forgotten. Towner comes from a long line of lace readers: women who can tell others' fortunes based upon the natural patterns found in lace, a talent which Towner knows she shares but refuses to acknowledge. Upon returning to the small town, she discovers that the life and people she left behind haven't really changed all that much and she begins to become enmeshed in all the old eccentricities that she thought she left behind. But odd and frightening things begin to play out almost as soon as she enters the town, beginning with the disappearance of two local women, one of whom is her aunt. Foul play is suspected in both disappearances and one very dangerous and charismatic man is at the center of it all. But Towner has much more to focus on than the two women, for there are huge and painful gaps in her memory and being back home threatens to rip open all the old wounds that she had thought were healed. Now, with the help of John Rafferty, a man she knows almost nothing about, Towner will attempt to uncover the truth about the missing women and the shocking truth about herself. Filled with mysticism and darkness, The Lace Reader takes readers on a wild ride of deception, suspense and mystery. Reading this book was a strange experience for me. Though I can't truthfully say that I enjoyed it, I was still very much glued to the page. I think that the story was just too messy for me, with a lot of jarring plot elements thrown together and so much going on that the book felt really crowded. It was funny because early on in my reading, my husband asked what the book was about. When I began to explain, he said "Wow, all that? You've only read a hundred pages!" which I think sums up my reaction to the book pretty well. I thought that the writing and feel of the story were extremely well done and that the author had a gift for making the reader really get tangled into the story and want to follow it to it's natural conclusion, but I didn't feel like this was a story that I loved. Overall the pacing was very tight and there were some suspenseful moments throughout the book that had me wondering what was coming next, and I really liked the inclusion of the lace reading. But I thought there was just too much of everything, and after awhile I began to feel a bit overwhelmed. I also didn't have strong feelings for the protagonist. I thought Towner was a bit unlikable and cold and it was a mystery to me why it was that I should care so much about her. For most of the book she remains aloof and never really invests herself in any of the other characters or their situations. Without spoiling the plot, I guess part of her distance has much to do with the revelation at the end of the book, but she was really hard for me to like and care about because her emotions and actions always seemed so dysfunctional. I was really surprised that Rafferty got roped into helping her because for the most part, it didn't seem to me that she had a lot to offer, either as a friend or confidante. Mostly I felt that she was closed off and unreachable, which in my opinion doesn't make for all that interesting of a character. I want to see emotion and fire in a character. I want to see someone who is invested in life and has a strong grip on her emotions, not someone who doesn't seem like she cares at all about anything. I did, however, feel like the author did a fabulous job with the setting of the book. She imbued a lot of detail into the Salem setting and I felt that it was both arresting to read and easy to imagine. There were times when I felt I was standing in the town looking around at the places she described, due to the attention to detail that the scenery and setting was given. As a matter of fact, I can't remember a time when I have felt so drawn to the feeling of place in a book, and whether she was describing the island that Towner's mother inhabited, with it's craggy shorelines and freezing waters, or the overgrown and lush garden of her aunt, I think Barry did a magnificent job with giving her characters a place in which to live and work the life force of their story. Though I felt that the plot was overcrowded, I want to stress that I don't think the plot lacks verisimilitude. There were a lot of sections that had me mesmerized and I felt that there were many great moments in this book. So great in fact that I think what would have made the book even better would have been to spread the action out more and not try to throw in everything but the kitchen sink into this one book. I would have liked to have seen some of the action plotted a bit more slowly and with more care given to Towner and her personal story, instead of the hyper-plotted reality that I got. I mean, there was just too much happening, and I think that had the book been a bit more subdued and slow, it would have made a greater impact in terms of character and the relevancy of the story. I have so far avoided talking about the end of this book for two reasons: First is that I am not sure how I felt about the ending and second is that I don't want to give too much away. First off, I will have to say that I am not sure if I found the ending to be to gimmicky and predictable or if I thought that it was the perfect ending that enabled the story to lock all its elements into place. I think I feel a little of both. I've no doubt that the ending was meant to be a shocker and the kind of ending that people just exclaim and wow over, but when I look back I don't know if all of the events leading up to the ending quite ring true for me. It felt a bit like a tease to me, the kind of thing that is meant to be the pièce de résistance of the book, but I don't know if I was completely buying it. To say anymore about this would indeed be spoiling the book for those who have not read it, so I will have to leave it at that for now. Though I am on the fence regarding this book, I think I would still recommend it to other readers who relish dramatic and involving stories. I am certain that for the majority of readers this would be a great book to while away the hours with, and when I am forced to admit it, I think I might have to conclude that I might be a little to picky for this story to really work for me in all the ways that the author wants it to. This is definitely a darker read, so those readers who are looking for something light might want to avoid this book, but I think the book would work on many levels for those who love a good haunting read. 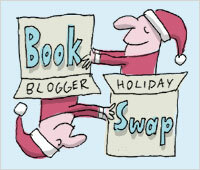 This post is a little late, but last Friday I received my gift from the Book Blogger Holiday Swap. It comes from Cecelia over at Adventures of Cecelia Bedelia, and it is a gift that is filled with many wonderful surprises! First off, she sent two funky and cool bottles of nail polish, one in taxi yellow creme and one in deliciously dark, which is a deep and dramatic purple. This is great because I have been wanting to expand my nail color selection beyond the same tame colors I have been using all year. Next was a cute little pencil that has little hearts with cute and toothy little faces printed all over it. She also included a packet of Crabtree and Evelyn lotion (one of my favorite brands!) and a small Picadilly notebook, which will be perfect for me to keep in my purse and jot down book titles I come across. Last, but certainly not least was a lovely paperback copy of Soulless, which is the first in a new urban fantasy series by Gail Carriger. I have been reading some very favorable reviews of the book, and am super excited to have gotten my own copy! everything was wrapped in festive santa claus wrapping paper and came with a gourgeous card wishing me a Happy Holiday. I must say that this was an extremely awesome gift and I couldn't be happier with it ! Thanks so much Cecelia, and I hope everyone out there has a wonderful holiday season and a spectacular new year! Just wanted to let you all know that Christopher Meeks has done a really great interview over at Backword Books, and is also hosting a giveaway to win a copy of The Brightest Moon of the Century, which I reviewed here. Please stop by here for your chance to win a copy of the book, it was a splendid read! Leo Binhammer is an English instructor at Carmine-Casey Academy, a private high school for girls. Adored and admired, Leo finds great contentment and solace in his profession as the only male teacher in the English department, doting girls following his every move. But Leo's world is disrupted when, one day, a charismatic new teacher named Ted Hughes arrives. This teacher is also a young and attractive man, and although he is friendly and amiable, Leo begins to feel displaced from his high perch at the school when the girls begin to notice and appreciate the attractive newcomer. As Leo learns to adjust to his new circumstances, life continues on at school and complexities and rivalries crop up in not only the students' lives, but in the teachers' as well. Leo and Ted become unlikely friends and Leo begins to unwittingly uncover all the many secrets and intrigues that Ted has kept hidden. Wryly amusing and stylistically deft, Hummingbirds is a cautionary and provocative tale about the overly fragile egos of two very educated men. I really enjoyed this book, and for the most part, I would have to say that it was extremely well crafted. I was impressed with the author's writing style. It was very fluid and engaging, and in addition, most of the writing was very witty and humorous. The author seemed really adept at creating humorous situations and dialogue that really made the story sparkle and sizzle. Other sections of the book were written a bit like prose: great imagery and succinct word choices that made an impact without being overbearing. The writing struck the perfect balance for me by being neither too sparse nor too wordy, and instead I felt that the author was able to capture the emotions and conundrums of his characters perfectly. The narrative was told through several points of view, but these shifts were handled very solidly and without a lot of confusion, making the multiple narrator strategy very successful. The story actually had three subplots: two involving the teachers, and one involving the students. It was very amusing to see that the teachers and staff had more drama and intrigue going on than the students did and that they handled their dramas with much more immaturity and snark than a group of teenage girls ever could. Though the story that focused on the students was interesting and involving, I thought that the grist behind the teachers' escapades was much more satisfying to me personally. I think on the whole, the story was integrated very well, with neither side dominating the limelight excessively. I also thought that all of the characterizations were done very well and were remarkably detailed, though my favorite was the exasperated Binhammer, who sometimes could be a bit churlish when it came to his waning popularity. The author really had the knack for crating well rounded three dimensional characters, and I thought that he was quite brilliant in his creations of the schoolgirls. He managed to capture all the innocence and seductiveness that was teetering on the edge of their femininity remarkably well, and it was not hard at all to take them seriously as both girls and women due to their expert creation. The only part of the book that I took exception to was the ending. Up until the last section of the book, I was happily reading along and spending most of my mental energy in being impressed by the author's turn of phrase or expert scene creation. I was completely taken by surprise by the turn the book took towards the end, and the main thing that bothered me was not the direction that the action took in the story, but the way the characters reacted to it. I don't want to say too much about the plot twist because I fear I will be giving too much away to those that are going to read the book, but after a certain point, I didn't think that the reactions of the surrounding characters were very realistic, especially in the case of Binhammer. It was almost as if he changed some of the fundamental aspects of his character. After examining it more closely, I also draw the conclusion that perhaps the reader doesn't know the true Binhammer until the ending of the book, and that these revelations about his character had always been there just waiting to be exposed under the right circumstances. Whatever the case may be, I felt that the ending left me a little bewildered, if not taken aback. I don't think that my bewilderment at the conclusion of the book drastically affected my enjoyment of it, and to a certain degree, I think it may have changed or even enriched the complexity of the story, so I can't really say that the ending was a disappointment. Rather I will say that I think it was a little unexpected and made me reshape the terms under which I was reading. There were a lot of wonderful aspects to this story and I think that if you are the type of person to appreciate witty and satirical writing, this is definitely the book for you. The plot and character creation were first rate, as was the smooth writing. This is not only a great book to lose yourself in, it is a book that will make you think and evaluate the power of interpersonal relationships. A great read.